TWU hosts the Denton Black Film Festival for an evening of FREE screenings for TWU students, faculty, staff and friends! Call in a chip from one of your TWU pals, then go check out Glitterbomb at Andy’s or Comedy Night at Armadillo Ale Works! Hometown Polka Heroes top-off the tree lighting with some booty-shaking renditions of holiday standards. 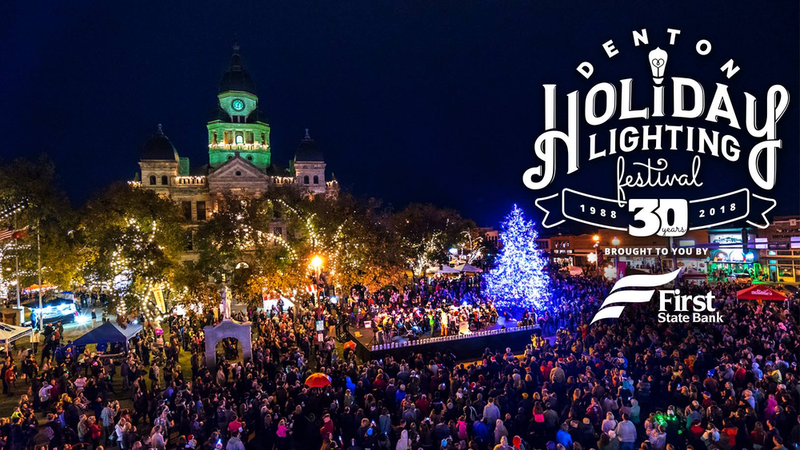 Browsing Denton businesses always pairs nicely with Saturday Jazz Brunch at The Chestnut Tree after some Yoga On The Square, but if you’re taking the DCFOF Holiday Express then you have a day of dancing elves and North Pole adventures ahead of you! Cap off your evening with the monthly Star Party at UNT’s Rafes Astronomy Center! The 2nd Annual Steak, Barbeque, and Chili Cookoff with Fun & Games contests, all proceeds benefit the North Texas Fair Association Scholarships Fund. Six featured homes representing several architectural styles and built between 1900 and 1924 will be open to the community for these special guided tours. These storied homes are located in two historic neighborhoods north of UNT, one created by the early faculty of the North Texas State Normal (now UNT) and the other in the John B. Denton College Neighborhood. Tickets are also available at the Discover Denton Welcome Center. Let's have ourselves a Merry Little Market to shop local. Fresh Margaritas and handmade gifts during the holidays, what more could you want before headed back downtown for night two of Wassail Weekend?! Always wondered what Studio E aka the "Bears Den" looks like? Pictures don't do it justice so go see for yourself what this new downtown venue is all about! Also take the opportunity to wander around the block to check out Q’s Café! Pour Me Another: A Drunkenly Debaucherous Burlesque Brunch, presented by Salty Lady Burlesque! Enjoy acts by Black Orchid, Victoria Vi King, Honey Sin Claire and Kabrina D. Sierra! We'll also have the comedy stylings of Taylor Higginbotham! All hosted by Ranch Drescher (Kristen Gaddis)! Plus trivia, games, mimosas, Bloody Maries, and a mountain of waffles!! It’s a Holiday Party with Denton’s Thin Line Film Festival! Gift Raffle with amazing wrapped gifts YOU could win! Purchase raffle tickets, when your number is called, you pick out a wrapped gift! It's a super fun way to give back AND Holiday shop! !